Volunteering on a Medicine & Healthcare project in Sri Lanka is an eye-opening experience. 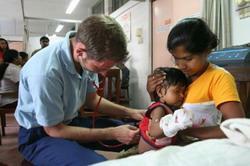 As a Medicine & Healthcare volunteer you will gain a great deal of valuable work-experience in a variety of departments. The facilities are generally of a basic standard. We have Medical & Healthcare placements based in the coastal towns of Panadura and Kalutara (about 45km south of Colombo) and also in Galle (115km south of Colombo). Volunteers normally work in a variety of departments on a two week rotation system, with common departments being General Medicine, Obstetrics and Gynaecology, Maternity, ENT and Paediatrics. It is also possible to spend a few days working in Neurology, the mortuary, rheumatology and the chest clinic. If you let us know your particular interests, we can usually arrange for you to work within your areas of preference. The amount of hands-on experience that you, as a Medicine & Healthcare volunteer, can gain depends on your level of knowledge and experience, but also your level of enthusiasm and commitment. Many volunteers do receive the chance to get much more involved in the procedures than would be possible in your local hospital at home. For example one pre-university volunteer helped deliver five babies on just one day! There are also opportunities to spend time in some specialised clinics, usually including some traditional Ayurvedic experience. This will give you a well-rounded understanding of medicine and healthcare in Sri Lanka and in the developing world in general. If you wish to volunteer in Sri Lanka as a qualified Physiotherapist, Nurse or Midwife the hospitals and clinics we work with are very willing to receive you. If you are currently training, or even just considering one of these areas as a future career, you can still have a role to play; shadowing professionals who will be able to teach you all about the field they work in. You can do an Elective in Sri Lanka in Medicine, Physiotherapy, Nursing or Midwifery.